After six months of negotiations, the San Luis Obispo City Firefighters Local 3523 and the city reached a tentative agreement late Monday evening. 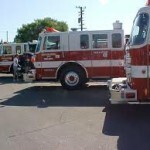 City officials and union negotiators agreed on a four-year-contract that upon adoption will back date to Jan. 1 2012. According to the agreement, firefighters’ health benefits and current pay levels will remain unchanged over the next four years, including no cost of living raises. Union officials also agreed to pay a 9.5 percent share of their pensions to be enacted during a 12 months period. In addition, the negotiators agreed to an employee two-tier system with new hires receiving 3 percent in retirement income for every year of service at age 55 while current employees receiving 3 percent at 50 years of age. City officials said the pension reform agreement will save the city $433,700 this year with a future contemplated saving of $520,000 a year. Before being formally adopted, the city council needs to vote in favor of the agreement in open session. After the council met in closed session yesterday to approve the agreement, staff informed Erik Baskin that the negotiations had been tentatively approved. “Overall, what we have been able to do is to achieve stability over the next few years and also protect the health and safety of our members and the community at large while continuing to provide a high level of service for the residents of San Luis Obispo,” Baskin said. Any updates about the SLO firefighter SLUG THUG John Ryan Mason? is he still on administrative duty or did they silently slide him back onto full duty? This is a pathetic start. So tell me how are we going to pay for this. The firefighters are getting another free ride. the article is inaccurate. they have agreed to 9%, not 9.5%. One question for Mr. Baskin, does John Ryan Mason “protect the health and safety of our members and the community at large while continuing to provide a high level of service for the residents of San Luis Obispo”??? Is this the same guy who said “PEOPLE ARE GONNA DIIIIEEEEEEEEEE!”? If the City really wanted to save money they would do away with free Medical for their employees for life. Retired Ken Hampien (City Manager), Bill Statler (Finance Dir), Ms. Liden (Police), Jeff Jorgensen (City Attorney), John Manderville (Community Dev), Ann Slate (Human Resources), and others get free life time medical and the largest retirement packages – what is this costing the City annually. The ones on top always get taken of first. Nice! Slobird…..no employees get lifetime medical. All those people you named were management. Hmmmm. Is management taking the same deal? Probably not. Management would never lock themselves into a 4 year deal without the ability to give themselves raises, cost of living increases and increases to cover the inevitable insurance premium increases. Not to mention management would never consider 3 @ 55 for any of their positions. How long do employees have to take it in the rear before people start holding management to the same standards? First off management doesn’t get 3% at 50 only public safety gets that retirement, second off you are right that management would never sign a 4 year contract that’s because management doesn’t have a contract, they are all at will employees..
Really? What did they just hire the new police chief at? yep, 3 @ 50. What do you think the fire chief gets? Yep, 3 @ 50. They are management. And management don’t have contracts? Ask City Manager Katie Lichtig about her contract. Last time I checked both the police chief and the fire chief were both sworn officers. That means at any given time they can be asked to do the same job as the front line people that’s why they get 3%at 50 . As for the city manager and the other management employees they are not part of a union so that means if you want them out so bad then step up start the process and get them removed. other wise stop bitching.. So, no cuts in service, no reductions in staffing, a “tinkering” with their pensions and enacting a two-tier system, and no pay increases; I do have to wonder how the fiscal conservatives will twist this agreement to say somehow the “evil” unions screwed the taxpayers? I say good job to the negotiators for being able to hammer out an agreement that achieves all that this did. bob: I think what the fiscal conservatives might say is that it is unfair for “pay levels (to) remain unchanged over the next four years”. The fiscally conservative might argue that the overly-generous current pay system is now locked in for the next four years. They might argue that it is unfair today, and even more unfair tomorrow. Private industry gets no promise of that sort. That is how the fiscal conservatives might see it. racket: Thank you for a well stated, simplified explanation of a fiscally conservative response. It seems like what conservatives would want is to strip away any protection for the firefighters current rate of compensation, without regard to what could happen. Is the amount of money we spend on fire protection and response so outrageous that it is the only division of the city that you would want to cut back on? Actually I’m going to assume that you would also like to cut back on the police department as well; do you really want to see San Luis Obispo head in the direction of Paso Robles? Too-generous compensation is just one of a host of problems in the eyes of this fiscal conservative. Of course I do not want us have Paso PD’s problems, and I agree that the bulk of their problems stem from issues completely unrelated to compensation. But, let’s look at them in the hypothetical (and grossly simplified) for a moment: Say Paso PD’s payroll budget is $1 million annually. That equates to ten $100K officers. But if cops only cost $75K, then we would get 13.3 cops for the same milllion dollars. Another point: The funders of police/fire/government payroll are making less than ever prior in their work lives. The flip side of that is that the cost of each thing takes more of their scant resource. Another hypothetical: When I was making $100K/year, the $5000 I paid for prop taxes was 5% of my income. Now, I am making 20% less, and the $5000 is a more significant part of my overall income.